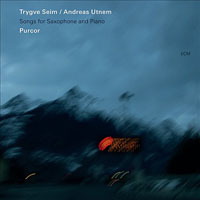 Norwegian saxophonist Trygve Seim may lack the marquee status of countryman (and fellow ECM artist) Jan Garbarek. But he is no less adventurous, and has recently been popping up all over on 2016 ECM releases: on Mats Eilertsen's Rubicon; with Sinikka Langeland and the Trio Medieval on The Magical Forest; with Iro Haarla and symphony orchestra on Ante Lucem; and now on his own Rumi Songs. Seim composed his first settings of the poetry of 13th century poet and mystic Jelaluddin Rumi in 2003 at the instigation of the late soprano singer Anne-Lise Berntsen. 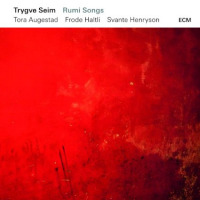 Mezzo-soprano Tora Augestad commissioned the complete Rumi Songs cycle after Berntsen died. 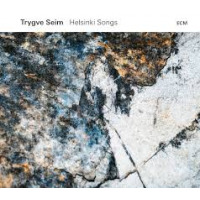 Seim has been heard on more than 20 ECM albums, including Sangam (2004) with his large ensemble; recordings with the collective The Source; with guitarist Jacob Young on Forever Young (2014), and more. Singer Tora Augestad makes her first ECM appearance. Accordionist Frode Haltli has appeared on several ECM recordings, including Yeraz (2008) a duo recording with Seim; he is also a member of Seim's Sangam ensemble. Cellist Svante Henryson has appeared on ECM albums in duo with pianist Ketil Bjornstad on Night Song (2011) and as a member of Jon Balke's Magnetic North Orchesra on Kyanos (2002). The task of setting poetry to music prompted Seim to immerse himself in art song; at the same time he was investigating Arab music, spending extended periods in Egypt collaborating and studying. With the exception of the brief instrumental "Whirling Rhythms" these settings definitely sound like art songs. At first listen they could be at home in the ECM New Series of "classical" recordings. But perhaps the flexibility of the arrangements is one explanation for their release on the main label. The accordion and cello parts were sometimes strictly written out, other times given a lead sheet to work from, with the details shaped in the playing. Haltili and Henryson are both equally good at improvising and being ensemble players. Vocalist Augestad has an especially diverse performance background. Early specialties include the musical theatre of Eisler, Brecht and Weill; her recital repertoire includes modernists like Cage, Schoenberg and Berio; and her own band Music For A While includes Renaissance and Baroque music by Dowland and Purcell combined with improvisation. So hers is not a typical European classically trained voice, and she proves adaptable to all of the stylistic turns these Rumi settings take. "In Your Beauty" opens the set with an invocation to beauty, the music staying in European concert mode, with the accordion playing a pipe organ role. "Seeing Double" immediately broadens the stylistic range, first flirting with tango (fine idiomatic solo by accordionist Haltli, accompanied by a pizzicato bass line from cellist Henryson), then into a rubato section with an eastern feeling from Seim's tenor saxophone. "Leaving My Self" features a subtle Indian inflected melody, phrased by voice and cello together. "When I See Your Face" again uses a Latin dance rhythm at first, then dissolves into a rubato Middle Eastern feel. The sole instrumental track "Whirling Rhythms" makes a special demonstration of the rapport between Seim and accordionist Halti. "There Is Some Kiss We Want" closes the program with an especially memorable melody, first introduced by the saxophone, then beautifully stated by Augestad and expounded upon by the accordion. Ultimately beyond genre, these chamber songs do have a certain spiritual affinity to the Rumi settings on countryman Tord Gustavsen's album What was said (ECM, 2016) with vocalist Simin Tander and drummer Jarle Vespestad. Track Listing: In Your Beauty; Seeing Double; Across The Doorsill; The Guest House; Leaving My Self; When I See Your Face; Like Every Other Day; The Drunk And The Madman; Whirling Rhythms; There Is Some Kiss We Want. Personnel: Tora Augestad: vocal; Trygve Seim: tenor and soprano saxophones; Fode Haltli: accordion; Svante Henryson: violoncello.